“War on women” rhetoric crumbles before faithful exploration of who we are. Vatican City — “Ever ancient, ever new.” It’s hard not to think of St. Augustine when you’re walking past a synod of bishops, on your way up to meet the pope in Rome, as I was on Thursday morning. The Mass marked the 50th anniversary of Vatican II, the opening of what Pope Benedict has designated a “Year of Faith,” and the first week of a synod on “the New Evangelization.” And it happened to be on the same day that two Catholics were to face off in a vice-presidential debate for the first time in history. I was in Rome to receive, as a representative of the United States and of “women throughout the world,” a message first delivered by Pope Paul VI at the closing of the Second Vatican Council. There were seven messages to the people — to rulers; to people of thought and science; to artists; to women; to the poor, the sick, and the suffering; to workers; and to youth — in 1965, which Pope Benedict re-presented on October 11, 2012. No small task! But can anyone deny that we’re a culture in need of such a thing? That there’s a need for women and men to be working together without the hostility all too often present in our conversations about life, liberty, and the pursuit of happiness — and all too often present in our lives? #ad#The peace that Pope Paul VI spoke of is made possible by quiet witness, bold public integrity, and a deliberate fostering of the complementarity between men and women that is inherent in our nature and that helps us to flourish. We have gotten so far away from that peace that we’ve reached the point where the federal government has by regulatory diktat declared fertility to be a disease, a source of oppression for women, one that must be suppressed if women’s freedom is to be achieved. That’s just how we find ourselves confronted by the Department of Health and Human Services’ abortion-drug, sterilization, and contraception mandate, which has Americans — Protestants and Catholics together — suing for their religious liberties, while others are completely unaware that there is a problem, believing that it is simply an issue about contraceptive access — and this in a country where contraception is nearly ubiquitous. Probably they believe the vice president when he lies about the issue, as he did during the debate on Thursday. That’s what Verily’s title means. A few fashionable young gals came up with the idea for the magazine over brunch one day in New York, and they confess that the title expresses something of their exasperation. It captures not just the vision and the mission of the magazine, but also the style in which they want to communicate its positive, integrated message about being authentically feminine in the 21st century. With women like these trying to help us understand again what true freedom and liberation is — not a battle of the sexes or a conflict of rights between a mother and child — any resonance of the “war on women” rhetoric thrown at Paul Ryan and Mitt Romney for simply daring to defend religious liberty and the dignity of innocent human life starts to crumble. As was first stated in 1965 and repeated today: “The hour is coming, in fact has come, when the vocation of woman is being achieved in its fullness, the hour in which woman acquires in the world an influence, an effect, and a power never hitherto achieved. That is why at this moment, when the human race is undergoing such a deep transformation, women impregnated with the spirit of the Gospel can do so much to aid mankind in not falling.” When we start to look at one another — and ourselves — with a deep respect for who we each are and why, then we find true liberation. Falling, we buy into hurtful untruths about men and women and how they relate to one another. Falling, we don’t treasure the gift of procreation and life. Falling, we don’t realize that the women of Verily have a friend in Rome. He helps, as they help. They are co-workers in something better, in saving the peace of the world, at home and abroad, at home and in the workplace, online and on the magazine rack. No war. Not enemies. Just moving forward together. 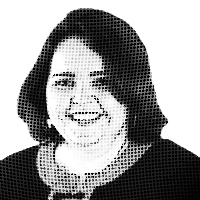 — Kathryn Jean Lopez is editor-at-large of National Review Online. This column is available exclusively through Andrews McMeel Universal’s Newspaper Enterprise Association.